*All images are printed from our own facility in Providence, RI with great care. Larger customized prints are limited edition and can be printed up to 12 feet in length. Only 10 editions of each image will be printed at sizes larger than 6 feet. *Picture sizes are of actual printed image without any border. Add 6 inches to both dimensions for frame sizes. Prints without frames will be given 1/2 inch borders. *Custom frames are designed and fabricated by Ron Kuhn. Frames are made from poplar wood hand selected by Ron for its color and wood grain. Each frame is unique. *Please contact buriedice@gmail.com for customized print sizes, pricing, framing options, and any questions about shipping. This image is composed of over 2000 photos stitched into an ultra high resolution 360˚ panorama of Dipboy Cirque. It was Shot over a 2 hour period as a storm approached from the South. If you look close you can see scientist Sean Mackay far in the distance. This image is composed of over 700 photos stitched into an ultra high resolution panorama of Beacon Valley's north wall. The photos were taken at 3am only 10 meters from my tent. Overlooking the Labryinth, this image is a single frame captured from an overnight timelapse video. It was taken at 2am, just as the sun peaked aroung the valley wall and through the clouds. Composed of over 90 photos at 3 different exposures, this image is a 360˚ view from the Mullin's Valley Headwall. Facing northward at the center of the image is the rock covered valleys, but facing southward towards the edges of the image you can see the endless ice sheets of Antarctica. Composed of over 90 photos at 3 different exposures, this image is a 360˚ view of Mullin's Valley and Beacon Valley. The sandstone ventifacts carved from the valley walls are magical. This image is cropped from a larger image composed of over 2000 photos. If you look closely you can find our team setting up camp in the distance. This image is composed of over 2000 photos stitched into an ultra high resolution 360˚ panorama of Dipboy Cirque. It was Shot over a 2 hour period as a storm approached from the South. 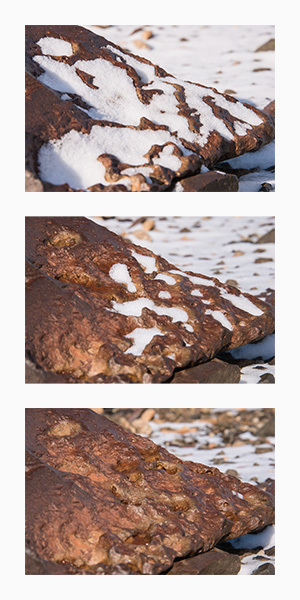 This image is of 3 photos from various locations in Beacon Valley. 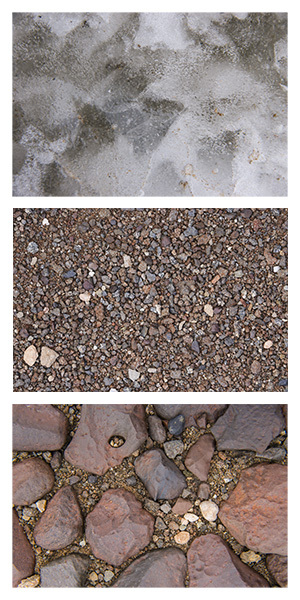 Each photo represents a 6" section of the different textures seen on the valley floor; the oldest glacier ice in the world, sand paths, and cobblestone pavements.